In 2004 Topps set up a table at the San Diego Comic Convention. 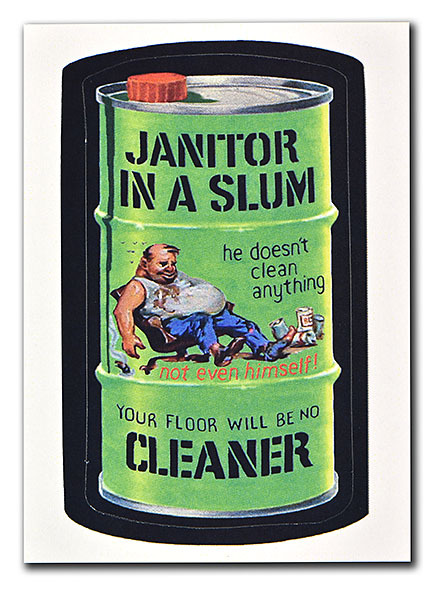 A collector was there and noticed they had displayed in their glass display case a partially finished title Janitor in a Slum that nobody had ever seen before - a very cool Saunders title. He took a picture of it and posted it on the Wacky Pack forum. From that picture somebody remastered it and finished the background and voila a lost wacky title was born and found its way into Lost Wackys Series 1. Eventually, in 2008, Topps started including their own Lost Wackys sporadically in the new series and Janitor in a Slum was published as such in Flashback Series 1.